Inter-operability in the smart home isn't a given. Even when using standards like ZigBee and Z-Wave, you'll still find products from different companies that don't work well together. This is why today's news that Fibaro's devices are now compatible with SmartThings is quite nice to hear. Fibaro is well known across Europe for making its own smart home solutions — hub and all — and it's been expanding in the US as well. It uses Z-Wave for its products and until now, those required community-written code to work with the SmartThings hub if you didn't have Fibaro's own. Now you don't need that. You'll be able to add the company's sensors and devices directly in the SmartThings app without any tinkering. In the US, compatibility is available for Fibaro's Motion Sensor, Flood Sensor, Door/Window Sensor and Sensor 2, which you can use to trigger notifications and automations; as well as its Dimmer 2, Wall Plug, Single Switch, and Double Switch to execute commands. In Europe, these same products are supported (though in their EU configuration) as well as the Smoke Sensor and CO Sensor. So if you have a SmartThings hub now, your choices for Z-Wave additions just widened a bit. And if you already own some of Fibaro's products and were using a third-party integration, you should now be able to add them easily. Chicago, IL – March 20, 2019 – FIBARO, a leading global manufacturer of wireless intelligent home automation and control devices, today announces an exciting integration with the SmartThings platform for Fibaro devices. Through this integration, many of Fibaro’s most popular Z-Wave smart home sensors and devices are now fully compatible with the widely adopted and deployed SmartThings platform. SmartThings open ecosystem makes it easy to automate and manage the smart home with the SmartThings hub and the SmartThings app. Compatible with hundreds of third-party devices, now including the full line of smart home sensors from Fibaro, SmartThings enables user to expand their smart home with lights, door locks, cameras, voice assistants, thermostats and more. The same devices listed above are now fully compatible with the SmartThings platform in Europe in addition to the Fibaro Wall Plug, the Fibaro CO Sensor and the Fibaro Smoke Sensor which are available and fully compatible only in Europe. Additional devices from the Fibaro ecosystem will continue to be added to the list moving into 2019. 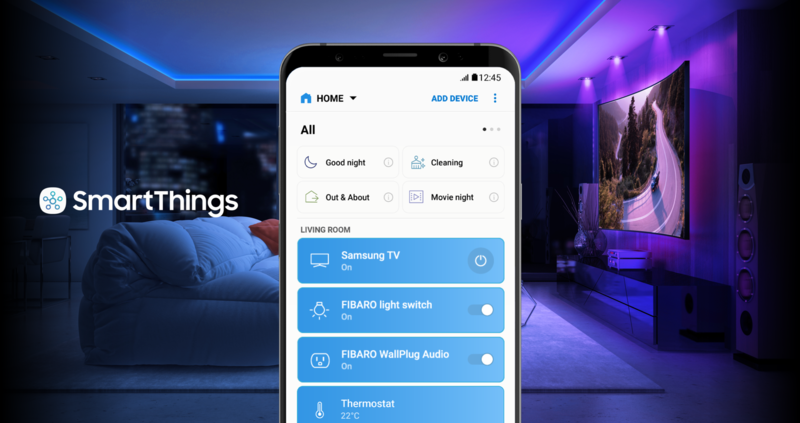 The direct integration of Fibaro devices within the SmartThings platform gives users the ability to extend their smart home network and set up new devices and solutions. Fibaro’s eloquently designed and high-quality devices are intelligently engineered to provide a number of beneficial features which SmartThings users can now take full advantage as a result of the integration partnership. Adding and enrolling Fibaro Z-Wave devices into the SmartThings platform is simple via the SmartThings Connect App for iOS and Android as the direct integration enables the list of compatible Fibaro devices to populate once in pairing mode. SmartThings users now have new choices when it comes to the setup, control, management and protection of their smart home. The new integrations mean Fibaro devices are fully compatible with other smart home devices and solutions within the SmartThings platform allowing for all-new combinations of devices designed to help end users accomplish a truly smart home. Fibaro devices can now be used to control other devices within the SmartThings platform or be controlled by those devices. Users can also use Fibaro devices to trigger smart home scenes and automation within the SmartThings system. For more information about Fibaro please visit: http://www.fibaro.com/us.